Snippets of Jack: "We're going on a bone cage ride." "We're going on a bone cage ride." I thought we should return to the spectacular island of the Pelegostals, aka the canibals. I know that we have addressed this team several times (which you should all read) but this post is even more! 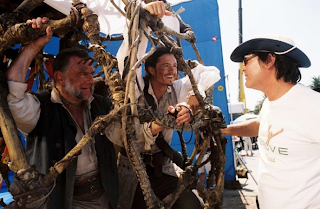 We're discussing all the technicallities and special effects used during that scene, specifically the hanging bone cages that traps Will and the rest of the crew. Now, obviously the directors did not actually hang them over a large cliff in a ball made of really human skeletons, because that would be dangerous and gross. 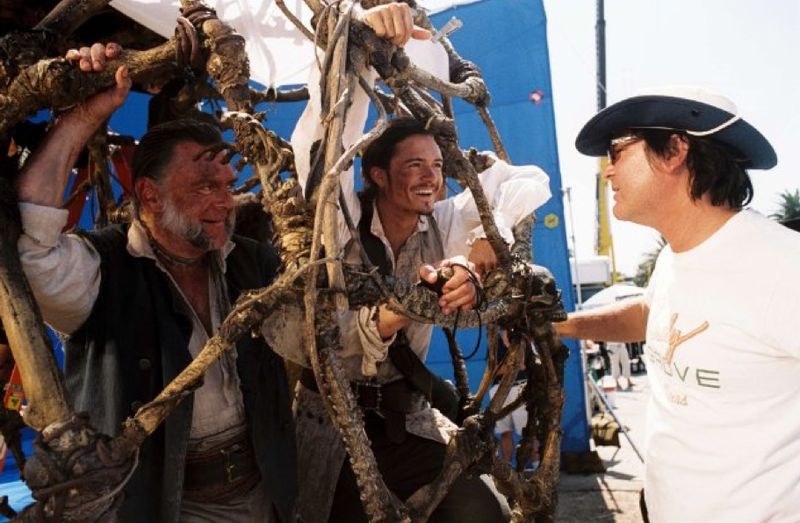 But the cast was hanging in a ball of bones made of styrofoam over a green screen. Orlando Bloom (Will Turner) seemed pretty exited from inside to see how this whole experience would go. "It's like a new ride at Disneyland" commented a member of the crew (technical crew, not Jack Sparrow's crew). How cool would that be if it actually were a ride??? Gore Verbinski, the director, even admitted, "We're not quite sure what's going to happen." What encouraging information. He had to say this loudly so the people can hear them from ten feet above, hanging from a crane. Verbinski actually never told the victims what would happen because he wanted to get the most realistic reactions of horror and shock from them. Quite the interesting directing skills, but it seemed to work out because the movie was absolutely wonderful! (As swere the other two Pirates films he directed). They pulled the cage towards the crane and the actors get ready to swing. Bloom was especially happy, "We're going on a bone cage ride!" He said that quite creepily and excitedly. And then they let the thing go and it falls very quickly. Their screams in the movie probably weren't so far off because the swinging looks almost like a roller coaster. Kevin McNally (Gibbs) looked like he's about to puke but Orlando Bloom still seemed to enjoy it all. This caused the director to call a reshoot, so they got to do the whole thing all over again! Oh joy. Martin Klebba (Marty) even puked during the swing. So thne they had to do it atleast four more times to get all the shots and the right reactions. The actors are terified the whole time but the crew just laughs in amusement. Most of the scenery of all of that island was altered visual effects. There were some shots that were all generated by the computer. This really shocked me because while I knew that it couldn't all have been real, I didn't realize that so much of it was created. They've got quite the tech crew, almost as good as Jack's crew! There could be more that you didn't know from this scene. For once thing, do you remember when Will was asking around to other people in the pirating community for news on Jack's location? Well one man tells him about the Island of the Pelegostals, where the "long pork" is apperently tasty. Incase you didn't pick this up, "long pork" was a less disgusting way of saying "human flesh". Ew. This was so gross that this movie was actually banned in China for its descriptions of canibalism! I wonder if the Chinese have seen some of Hollywood's latest horror movies. 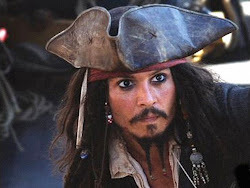 If you are more interested in the filming of the Pirates of the Caribbean follow our blog for more to come! You should also check out imbd.com and the bonus fealutres on your own copies of the films. Feel free to share any information here! We would love to hear it!